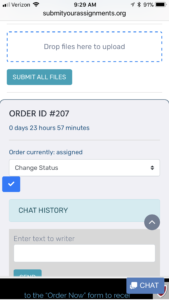 Instant Quote- Navigate to the Order Now form. Submit All Requirements- Submit All files, such as rubrics, instructions, and essential sources. 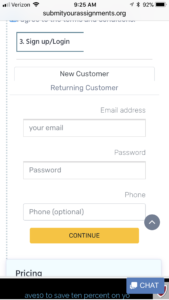 If satisfied with pricing, set up an account or log in as a returning customer. Payment– Make the amount in your dashboard and route the order to the most qualified freelancer available. 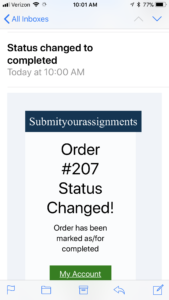 Order Completion– It is placed in pending status until Editors approve the order. Approve or Revision- You will select either option to inform the writer of your satisfactory. *You will receive email and SMS alerts when you register your account, place a new order, process a transaction and order delivery. • Placing Your Online Order (5-10 minutes, including new account registration)- We ask that you submit all required materials together, so there are no delays. 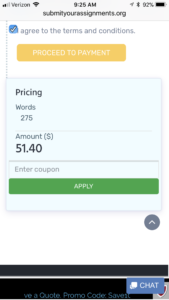 • Writer Assignment (30 minutes-2 days)- The sample ordering process window is between 30 minutes to 2 days, depending on your deadline and the type of writer selected for the order. Assignment Breakdown– The whole paper briefly on one page- for you to view the key points of the assignment. Visual Aids– an Assignment that needs graphs, charts or illustrations, spreadsheets, etc. Abstract- Most APA papers require ABSTRACTS, but many do not. Must select this feature if required. 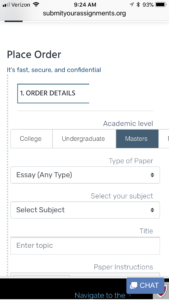 Access Blackboard– Feature that consists of us accessing the account materials you cannot upload for us. Readings– If you have readings that we need to complete to do an order, select one of the tabs that correlate with the page amounts. 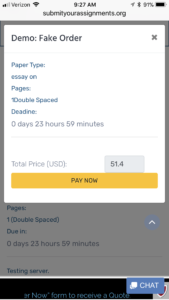 Include Plagiarism Report- We use a report for every assignment, you can have your report included for a small set fee. Include Digital Sources- Request PDF copies of the sources used. V.I.P Support- Orders are reassigned if assigned writer can’t complete the order. We will ensure there aren’t any delays. Order Monitoring- We will monitor your assignment to ensure it is being completed and reassign the order if necessary. 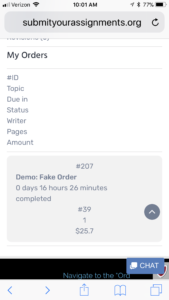 Bidding- This Folder will show you the # of orders you submitted in the process of being claimed by a qualified writer. 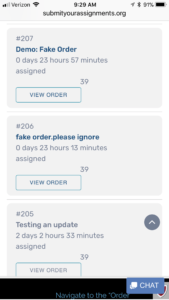 Assigned – This Folder will show you the # of orders you submitted, awarded to a writer that is in progress to be completed. Editing- This Folder will show you the # of orders that writers completed. The editing status indicates it is in the process of being reviewed and approved by the editors. Revision- This folder is the number of orders sent to revision by the editor or you, the client. Messages- The client will receive an email when they are sent a message. To respond, they must log into their account and select “messages” to locate which order the message came from. Affiliates-This Folder will provide you with a unique URL to share and send to friends; you can make money off every order they submit and get paid once a month. Rewards- Once you order five or more assignments, you will start to receive discounts on future orders automatically. My Writers- A list of your previous writers used for various assignments. Wallet- Get 5% cash back with every wallet recharge. Use balance to pay for assignments. Writing– Have a writer present a mock-up overview of your assignment order details. Rewrite- Have a writer perfect work you’ve already done. Editing- An editor can fully edit your order, such as grammar, style, spelling, citations, formatting, etc. Powerpoint– An order that only needs a powerpoint without a paper. Standard- We will match you with the best writer possible based on your order details. Previous Writer- Work with a select expert from your last assignment. Top Writer- Upgrade to a writer highly proficient in the area of work and the top 10% of our writer pool. Looking to Earn Back Some Cash? Check out our Referral Program. Every registered Member/Client are eligible to earn money just by referring us to their friends or family. 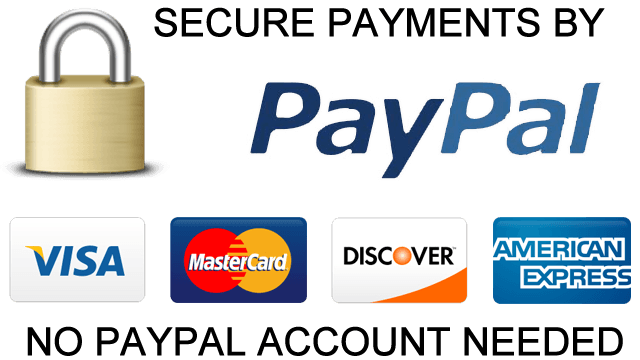 Login Your existing account, or register as a new member. Select the tab, and then Copy your unique link and share it with friends. Get 2% profit on each next order and every referral. Get Paid once a month. Top Up Your Wallet, for 5% cash back. Select the tab, and then ADD money to your wallet to get 5 percent cash back. Use the money in the wallet to pay for your assignment.